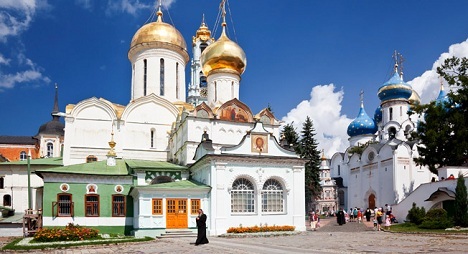 Located 70 km northeast of Moscow, the monastery is considered the spiritual home of the Russian Orthodox Church and has over 300 resident monks. St Sergius of Radonezh, a venerated Russian saint, founded the monastery in 1345, with a construction of a simple church. Ten years later, the saint brought about a monastic charter that called for the construction of the supporting buildings like living quarters and a kitchen. His followers used the charter as a model and this is visible in famous monasteries such as Solovetsky. Many of the churches in the complex also display art work by some of Russia’s most well known painters. Replica works of Andrei Rublev and Daniil Chyorny don the entrance walls. The great painters were summoned by Ivan the Terrible to decorate the main 15th century cathedral with frescoes. Recently more than 30,000 pilgrims visited the monastery for special prayer services in honour of the 700th birth anniversary of St Sergius. There are often long queues to enter some of the main churches, but the complex itself is well spaced out and is a great place to witness the rising religious fervour in Russia. Sergeyev Posad grew around the monastery and is now a charming and easy going provincial town of around 114,000 residents. It is one of the towns on Russia’s famous Golden Ring of historic and cultural cities. Several Muscovites also have their dachas in the countryside near the town, making the drive there from the Russian capital, a bit of a nightmare on Saturday mornings in the summer. Make sure you buy some of the fresh baked bread from monastery and try out the kvas, a beverage made from fermented rye bread. If you are not driving down to the monastery, which is on the main highway to Yaroslavl, the best option is to take a train. Commuter trains leaving from Moscow’s Yaroslavl station for Sergeyev Posad every 30 minutes. The train ride usually takes an hour, and the monastery is about a 15-minute walk away from the station. Check out the official website of the monastery (in Russian).